The character influenced the creation and origin of Charlton Comics' 1960s superhero Peter Cannon, Thunderbolt, as well as Marvel Comics' Iron Fist character in the 1970s, and DC Comics' hero of the same name. 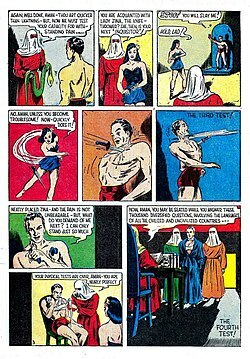 During the Golden Age of Comic Books, Centaur Publications produced Amazing-Man's eponymous series, Amazing-Man Comics, which ran from issues #5–26 (Sept. 1939 – Feb. 1942). Malibu Comics' Protectors #3, featuring Amazing Man. Cover art by Thomas Derenick & Mike S. Miller. In the 1990s, Malibu Comics used the Centaur properties, including Amazing-Man, as the roster of its own superhero team, the Protectors. Aside from the costume, the Malibu version was essentially identical to the original. Amazing-Man was introduced into the Marvel Comics universe, with the character Prince of Orphans revealing his identity as John Aman at the end of Immortal Iron Fist #12 (Feb. 2008). Earlier in the issue, Prince of Orphans is seen turning into a green mist while battling Davos. Additionally, under his original name, Amazing-Man is one of many public domain superheroes to appear in issue #0 of Project Superpowers, a miniseries from Dynamite Entertainment; a sketch of him is included in issue #2. In 2014, Barry Gregory and Steven Butler released a new series by Gallant Comics, The new series, titled John Aman Amazing Man, Gregory and Butler used other public domain characters, like Blue Beetle and Miss Masque, in 2015, launched a crowdfunding campaign in Kickstarter to finish a six-part arc. John Aman is an orphan from the West, chosen for his "superb physical structure" to be raised by benevolent monks in Tibet for the first 25 years of his life. Each member of The Council of Seven, as the monks are known, trained him to a superhuman degree of physical and mental ability, while also giving him the ability via a chemical solution to disappear into a cloud of green mist, earning him the secondary title of the Green Mist. After receiving his final tests, he is sent into the world to use his skills and abilities to do good. Opposing Aman, as he was often known, is his nemesis the Great Question, a disgruntled member of the Council of Seven. Aman had been sent by the Seven Cities of Heaven to assassinate Orson Randall — the Iron Fist before the present day Danny Rand took on that mantle—in order to kill another "immortal weapon" like himself. Chasing Randall around the world, Aman would come close to killing his foe, only to yield honorably when Randall's allies would be injured. Eventually, Randall hinted that the masters of the Seven Cities had lied to Aman concerning the Tournament of the Seven Cities, in which every decade the victorious city is allowed to merge with the Earthly plane. Feeling betrayed after discovering the cities' masters had developed gateways to Earth without the knowledge of the cities' populace, Aman dropped his quest against Randall and vowed to make the city masters pay. Randall told Aman to assist the next Iron Fist in a revolution against the Seven Cities. The character later appeared in Secret Avengers #6–12 as the Prince of Orphans, to assist the Secret Avengers against the Shadow Council. During this, it is revealed he met Captain America (Steve Rogers) during World War II. During the 2011 "Fear Itself" storyline, Prince of Orphans appears in Washington D.C. during Blitzkrieg U.S.A, helping with the rescue efforts, alongside War Machine, Beast and Ant-Man. He tells War Machine that the "Eighth City" has been opened. The character appeared as an antagonist in Matt Fraction's Defenders in 2012. ^ a b Amazing-Man at Don Markstein's Toonopedia. Archived from the original on April 4, 2012. ^ Nevins, Jess. "The Timely Comics Story". WebCitation archive. ^ "Roy Thomas interview". Alter Ego (70): 38. July 2007. ^ Jeff Christiansen's The Appendix to the Handbook of the Marvel Universe: Yü-Ti: "In the letter page to Marvel Premiere #15, [Iron Fist co-creator] Roy Thomas commented how the K'un-Lun origin of Iron Fist was inspired by the origin of Bill Everett's Amazing Man". ^ "GCD :: Issue :: Secret Avengers #11". Comics.org. 2011-03-30. Retrieved 2013-07-03. Wikimedia Commons has media related to Amazing-Man (Centaur Publications). Who is the Amazing Man? This page was last edited on 29 June 2018, at 22:18 (UTC).